Jean F. Hire, 3, born in July 1896 in Texas, both parents born in Tennessee, son of Samuel and Pina Hire. recorded as Fount Hire, 13, born in Texas, both parents born in Tennessee, son of Samuel and Pina Hire. Fay and her sister Elsie had a double ceremony in a buggy at Bolivar, Denton, Texas on March 25, 1918. Fay married Fount Hire; Elsie married Robert Little?. Fay was born 23 November 1900, daughter of Gerald Elmer and Jennie (Davis) Bentley, and died 14 Feb 1980. Fount Hire, age- 21, present address- Era, Texas, date of birth- July 22, 1896, place of birth- Era, Texas, father?s birthplace- Lafayette, Tennessee, name of employer- Self, place of employment- Era, Texas, name of nearest relative- Fay Hire of Era, Texas. second known child born: Kenneth E. Hire, in Cooke County. recorded as Fount Hires, 34, born in Texas, both parents born in Tennessee, 22 at 1st marriage, farmer; Fay Hires, wife, 28, born in Texas, both parents born in Texas, 16 at 1st marriage; Oldia F. Hires, daughter, 10, born in Texas, both parents born in Texas; Kenneth E. Hires, son, 4 11/12, born in Texas, both parents born in Texas. 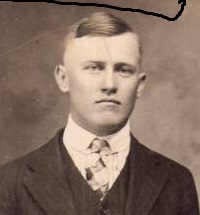 third known child born: Boyd Clint Hire. recorded as Fount Hire, 43, born in Texas, resided in rural Cooke County, Texas in 1935, no occupation listed; Fay Hire, 39, born in Texas, resided in rural Cooke County, Texas in 1935; Ouida Fern Hire, daughter, 20, born in Texas; Kenneth E. Hire, son, 14, born in Texas; Boyd Clint Hire, son, 2, born in Texas. Fount died at age 83 in Cooke County, Texas. Fount is buried in the Era Cemetery in Era, Cooke County, Texas with Fay. [S292] 1930 census for Cooke County, Precinct #6, Texas . [S291] 1940 census for Tarrant County, Fort Worth, Texas .